Stirred Not Shaken: Where Is All The “Silent Killer” Salt We Eat Coming From? Eating too much sodium is becoming a North American problem. Sodium consumption is one of the highest in the world. Americans eat more than double the amount of sodium that is recommended. 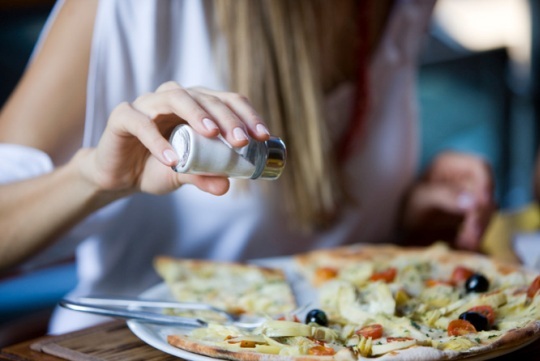 The American Heart Association as well as Health Canada recommend 1500 mg/day of sodium/day (=2/3tsp of salt), when on average Americans are eating 3400mg/day of sodium (=1.5tsp of salt)! Consuming that amount of sodium puts us at risk for heart disease and stroke, which is the number one cause of death in North America. Yet most people will tell you that they don’t add salt to their food or cook with it. So where is all that sodium coming from? Most of us trying to eat a healthy diet will choose whole grain cereals, low-fat diary products and other low fat alternatives. However, for manufacturers to maintain the taste they add more salt to these products. Low fat cottage cheese can have anywhere from 350-600mg of sodium per serving. Whole grain cereals can range from 200-400mg of sodium per serving. Healthy tomato sauce can have close to 600mg of sodium per serving. All the while we are under the impression that we are eating a healthy diet, but in fact we are eating one that is very high sodium. “The silent killer”. The best way to reduce your sodium intake is to prepare your own meals, but who has time?? So to be practical – read labels. Sometimes sodium is masked in the ingredient list as: MSG, baking soda, baking powder, cured, pickled, or smoked. It’s important to read labels but its imperative to understand the health claims. A product that says “Light in Sodium” means 50% less sodium than its original. “Reduced Sodium,” means it’s reduced by 25% of its original sodium content. (Keep in mind; products that have been reduced by 25-50% still might be very high sodium.) For example, Kikkoman Soy Sauce has 920mg/Tbsp of sodium and the “Low-Sodium” version has 575mg/Tbsp- that’s more than a third of your Daily Recommended Intake. “Low sodium” means 140mg/ per serving and “Very Low Sodium” is 35mg per serving. “Sodium Free” means it has less than 5mg of sodium per serving. Finally, “No Salt Added” means it’s made without the salt normally added, but still contains the sodium that is naturally part of the food. Don’t be fooled by marketing, sometimes manufacturers will put on “ Sodium Free” claim on foods that never had sodium in them to begin with!! Beside popular belief, food is not the only place sodium is hidden; sometimes it’s in medication. For example, 2 tablets of Alka Seltzer contain 1000mg of sodium. Another misconception is that Sea Salt has less sodium than table salt but that’s not true. Sea Salt has the same sodium content as table salt but the differences are the minerals and flavor. Kosher salt is also preferred for cooking because of it taste and texture but the sodium content remains the same. Some experts will say that salt is an addiction. The more salt you eat the more you crave it. The best solution is to gradually decrease the amounts of salt you eat, read labels and don’t be fooled by all the health claims.